The photo was taken on 9/15/17 at 4:15 PM. The location was in the kitchen of my home in Bethesda, Maryland. "The Take It!" Came as Chief Bottle washer and house decorator - I think it fitting to show the new arrangement for fall for the kitchen window. 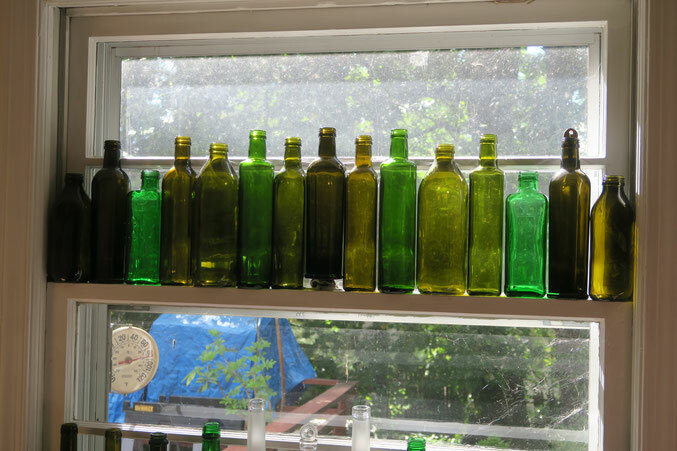 There was a hint of sparkle from the sun off the threads on the top of the empty olive oil bottles on the middle division of the window. By making this selection I am assured of having a green outlook until next spring arrives with an outside refresher of new foliage. The After Take: I have arrived at my five week anniversary from having right shoulder surgery. I am very highly usage restricted - thus taking this photo was from the unpracticed left hand. All a part of the game of compensation in the quest to bring back full function of the real working right arm. I am following Doctor's orders as want the best results. Am hoping you may also have a plan to keep some green to complement these next few seasons. Wishing everyone my very best. I bet when the sun shines through it looks incredible. My kind of style, if you can't have stained glass, make the next best thing!! GeorgieProf, MHampy and I hope your recovery is going well Bruce. Haven't seen any comments from you in months so we do hope all is well. We don't want to lose one of our favorite websites. You have provided many great lunches looking at your beautiful photographs and discussing your musings. I really really like your new banner. Its one of my favorites. Are all your windows like that? For an 'unpracticed left hand' it sure does look at steady as ever. What a great idea. I bet it looks beautiful when blasted with morning or afternoon sunlight. I really like the new photo at the top of your website, that is zoomed in on these bottles. Very pretty! Thank you to everyone for your staying with us as I have been making my way through this recovery program for my shoulder. This is my first week without a sling and am now using my right hand in concert with my left in typing this note. What a relief - lol. My complement and thanks go to Taylor for all of his help in keeping the ball rolling on several fronts, including Whutzzat.com. The photos and stories will increase, now that I have my camera ready hand back in play. I have to confess it is a bit shaky due to lack of use. Thank goodness for the " anti shake feature built into the camera. Again my sincerest thanks and appreciation for your kind welcoming back. The fun is resuming and the volume picked up. So good to hear from you, its been awhile. Glad everything worked out. Bet you're ecstatic to be out of that sling. I remember being in one for about 2 months or so 20 years ago and to this day I can remember just how uncomfortable it was for me. Congratulations on getting your hand back. Haven't noticed anything shaky so far, they look just as good as ever. I'll have to let Teri know we heard from you and that we will be getting more of your great photos. Our lunches just haven't been the same since only having one per week. Here's hoping your arm continues to recover. Glad you're doing well. Shoulder surgery is no joke.